Ethanol is a clear, colourless, flammable liquid, which we produce by the fermentation and distillation of sugar cane molasses, a by-product of the sugar industry. The molasses is initially fermented using saccharomyces yeast to produce a low alcoholic strength 'beer'. This is then concentrated and purified through various continuous distillation columns to produce a range of ethanol products of different strengths and qualities. 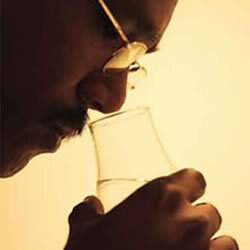 These varying grades of ethanol are essential raw materials in the manufacture of pharmaceuticals, cosmetics, alcoholic beverages, toiletries, homecare products, industrial products, essences, as an intermediate in chemicals manufacture such as esters and acrylates and vinegar (acetic acid). General Application: Used as a raw material in the manufacture of alcoholic beverages incl. vodka, gin, cane, liqueurs and alcoholic fruit beverages by our customers, the end user. General Application: Used as a raw material in the manufacture of alcoholic beverages by our customers, the end user. General Application: Heating/cooking applications; sterilization. General Application: Used as a raw material in the manufacture of alcoholic beverages incl. vodka, gin, can, liqueurs and alcoholic fruit beverages, by our customers the end user.